Meeting planners looking for a unique offsite activity now have one more option to choose from thanks to Magic Carpet Glide Tours. 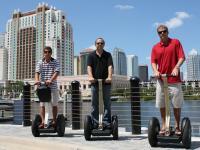 This brand new company offers tours in the downtown area that allow guests to view Tampa Bay&apos;s most breathtaking sites aboard their very own Segway. In case you don&apos;t already know...a Segway is a single-person, self-balancing personal transporter that can cruise up to 12 miles per hour. The 90-minute tour costs a mere $50 per person and travels through some of the best site-seeing spots in Tampa Bay, including downtown, Davis and Harbour islands, along scenic Bayshore Boulevard and the Channelside District. Visit the Web site for more details and to book your next tour. This is one activity you just don&apos;t want to miss!